Ok, so… Remember our last post, where we went through and told you EXACTLY where we were going to be, and when? Well… we lied. Sorry- I mean we have since revised. Based on a number of factors including listener/reader comments, events we didn't want to miss and things we wanted to see, we now have a NEW AND IMPROVED itinerary! That's right, upper-left corner! It IS in the Unites States! This is where we're really going. Like, for sure. For total sure. Unless something else comes up. Tuesday, May 14– Lunch in Wichita Falls, TX on our way to Dallas. Spend the night in Dallas. Wednesday, May 15– Lunch in Waco, on our way to Houston. Sleep in Houston. Thursday, May 16– Stay in Houston (we get to not drive for a day!). FUN MEETUP at night at the Fox & Hound Pub (11470 Westheimer Road)- Houstonites, be there or be square! 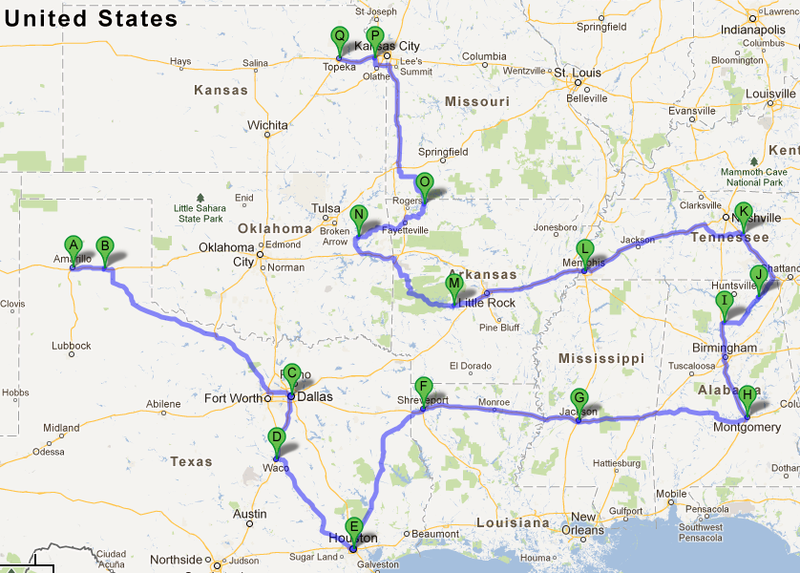 Friday, May 17– Drive to Shreveport, Louisiana. Have some fun (TBA). Sleep. Saturday, May 18– Head to Jackson, Mississippi. Sing "I'm going to Jackson" in the style of Johnny Cash the entire way. Sunday, May 19– AM church in Jackson, lord help us (yep- that means a church review), then press on to Montgomery, Alabama. Monday, May 20– A long and rather circuitous route through 'Bama will eventually land us in Murfreesboro, TN. Tuesday, May 21– We leave early, 'cause we gotta make it to Memphis before Graceland closes (though we'll pass through another town called Jackson, so we'll be singing Cash again before we start singing Elvis). Wednesday, May 22– Wave at Little Rock (maybe have lunch there- any Little Rockers out there wanna join us?) on our way to Hot Springs, Arkansas. Why Hot Springs? Who knows. Thursday, May 23– Drive through the beautiful (one supposes) Ouachita National Forest to Muskogee County, Oklahoma. Frank's old stomping grounds! I get to see where Frank practiced his trombone for marching band! I'm not making that up! Friday, May 24- Frank Family stuff. You're not invited. Saturday, May 25– Passion Play in Eureka Springs, Arkansas! EVERYBODY SHOULD COME TO THIS WITH US! Seriously, if you live anywhere even remotely close to Eureka Springs (and remember, compared to, say, Poland, most American locations are pretty close), you need to join us for this event! Then, we'll go find a place nearby that serves alcohol. Lot's of alcohol. So help me if Eureka Springs turns out to be in a "dry County", I'll know FOR SURE that there's no god. Sunday, May 26– Party in Bonner Springs, Kansas! We'll send you a full report. Monday, May 27– Stop in Topeka (home of those nice Westboro Baptists), do some stuff, have lunch, and then put the pedal to the metal, and get our asses home! So that's it. That's where we'll be and a lot of what we'll be doing! If you want to be a part of it, hit us up! If you're in one of these fine towns, let us know, and we'll try to announce where we'll be, so y'all can join in the festivities. See you soon! Have a great time I don’t live in any of those places but I have been to most of them. I’m sure you will give us a report on your trip as you go. Are you still going to do the show or do I have to wait until the trip is over? Have a great trip, you guys! I am so looking forward to your podcasts and church reviews from the road. You mean I need to drive to Texas to have a beer with you guys? Dang. Can you set up a teleconference in a bar somewhere? You mean I need to drive to Texas to have a beer with you guys? Dang. Can you set up a teleconference in a bar somewhere? Wait a minnit. You guys are going to Mississippi and Alabama? You’re braver than me. The “Big Texan Steak House” in Amarillo has a FREE 72 oz steak if you can eat it in under one hour. Video of this would be priceless. Have a great trip! I’m from Bartlesville Oklahoma, and my girlfriend and I just visited OK last week. Sorry we missed ya.. I second Brian H’s comment. Too bad we missed you guys in OK. We are new subscribers and proud to support. Thanks for being awesome! ah, no Austin! Well I guess we’re weird enough as it is! ah, no Austin! Well I guess we’re weird enough as it is! Enjoy the Lone Star state! A measly 18 miles more and you could visit the Community of Christ temple in Independence, Missouri. The very place where they say Jeebus will make his appearance at the second coming. Surely you can’t get that close and not at least drive by, can you?